amiQure Respiration Paste is a food supplement for cats that works by using a combined approach to clear airways and strengthen resistance. The usual approach to respiratory problems is to use antibiotics, mucolytics (mucous-dissolving agents) and supplements designed to boost overall fitness and revive the appetite. amiQure Respiration Paste offers a different way. This food supplement paste is an excellent and animal-friendly alternative that works by using a combined approach to clear airways and strengthen resistance. 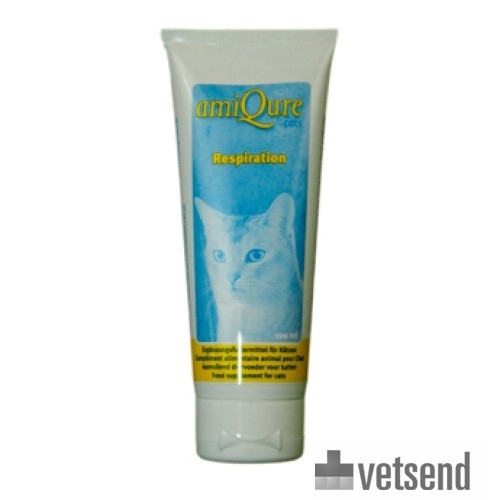 amiQure Respiration Paste consists of high-quality natural ingredients used to establish and maintain a healthy upper respiratory tract in cats prone to this kind of problem. Echinacea, zinc, vitamin C and Boswellia serrata extract strengthen the immune system, while selenium and vitamin E are antioxidants. As with other amiQure products, Respiration Paste is made up of a Multi-Action system, promoting healing of the respiratory tract in several ways. amiQure Respiration Paste strengthens the immune system. A daily dose of 3 cm (2 grams) of this paste can be applied to the muzzle or paw of the cat, or be mixed in with its food. Over time the dose can be halved, provided that the condition does not worsen. One tube holds 100 grams of paste. Administered in a standard dose to a cat with an average body weight of 4 kg, this is sufficient to last for 50 days. Have you used amiQure Respiration Paste before? Let us know what you think about this product. Our cat had had some sniffles and sneezes for a while. We got this product for him and within days he was much, much better. It is a great product. Good price. Very easy to administer. We just put it on his food and he doesn't even know it's there. Highly recommend this product.